Precious collectibles don’t have serial numbers like electronics. Manager of the FBI’s Art Theft program, Bonnie Magness-Gardiner, recommends keeping an inventory of provenance documents and an updated insurance policy to protect yourself in the case of an art theft in your home. In the unfortunate case that there is a theft in your home, you may be overwhelmed and not know whom you should call or how to handle the first steps with your insurance agency. For members of Artwork Archive, provenance documents and photos can be stored in your secure, private account to ease the filing process in such a stressful time. We hosted a Q&A with Anne Stout, Toole Insurance, and VP, Director of Claims Management at the AXA Art Americas Corporation to go over some of the important details of first steps of reporting an art theft in your home. 1. What is the most common way art is stolen from private collections? Burglary is the most common theft of artwork. Proper security is essential to prevent this type of crime. Audit your current security system for loopholes and work with your provider on properly securing your home. Additionally, we have found that contractors or vendors working at the residence have come under scrutiny as possible perpetrators. Professional agencies can be engaged to screen whether a person has a criminal history or a weapons violations. 2. When I discover my artwork has been stolen, who is the first person I should call? You should contact the police immediately when a covered work is stolen. Do not affect or make any changes to the crime scene. The prompt filing of a police report may positively impact the ability to apprehend fleeing felons and/or expedite search warrants. The insurance agent should be notified right after the police have been summoned. 3. What is the National Stolen Art File (NSAF)? The NSAF is a computerized database of stolen art and cultural property maintained at the FBI Headquarters. The art must have historical significance, be uniquely identifiable, and have a value of more than $2,000. If your artwork fits this description, ask the police to add the theft to the NSAF. Keep in mind you cannot report a theft to the NSAF yourself, the police must file the report. 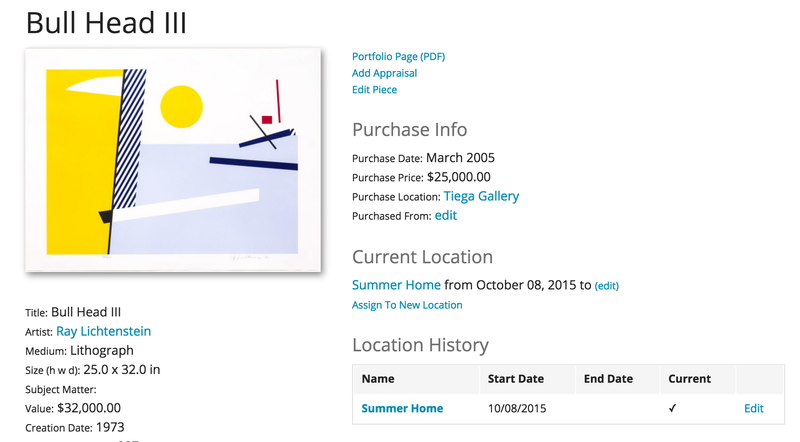 Tip: Keeping an image and a detailed record of each piece’s provenance and current value on Artwork Archive will expedite this process. 4. Should I also report to the Art Loss Register? The Art Loss Register is the world’s largest private database of lost or stolen art, antiques, and collectibles. You can make an account and register a loss on your own. This is a valuable source of documentation to prove a theft, even years down the line. In an interview with PBS, Art Appraiser Alan Fuesel, best known for his work on Antiques Roadshow, told the story of the Art Loss Register & diligent documentation recovering stolen artwork more than 30 years later. A family had 16 Tiffany vases stolen from them in 1971. More than 20 years later, they found the vases for sale at the Freeman’s Auction House in Philadelphia. With documentation from the Art Loss Register and original receipts, the family was able to recover their vases from Freeman’s. You can store digital copies of your original receipts in your Artwork Archive account, which will protect them from loss or damage. 5. What will the process be to report the theft to the FBI? Where were the works of art located? Were they stored or on display? Do alarm systems ring to a central station? How recently have the fire and electronic security systems been checked? Is the household help aware of emergency plans? Who has keys to the exterior doors and is the property ever unattended for long periods of time? 6. What information will my insurance agency need to make a claim? Your insurance provider will need an invoice or copy of the most recent appraisal with a date and the appraiser’s qualifications. You will also need to provide the name of the artist or maker, title of the object, date, measurements, and material of your piece. All of this information can be stored together in your Artwork Archive account, making it simple to export and send to your insurance provider. 7. What is the likelihood I will get my art back? Unfortunately less than 10% of stolen art is recovered. This further stresses the need for proper security and documentation. You can read more about the enterprise-level security of Artwork Archive here. 8. If I have no art insurance, and something is stolen, what are my options? You will need to work with law enforcement to recover the work. If there is no insurance in place there are no options of filing a claim or reimbursement. 9. What are my reimbursements options if I have a current policy? You can recover the amount of loss either with an agreed value policy, which is a contract where the insurer agrees to pay the insured a stated amount, or with the current market value–which you can safely store in Artwork Archive. The options should be further discussed with your broker. 10. How can I prevent against art theft? There are numerous security measures to be taken with valuable assets in your home. Facilities may be protected by a general perimeter or motion based security system. Home and building alarms have become very sophisticated as have closed circuit surveillance equipment. Work with your security system provider to ensure that your home is protected. 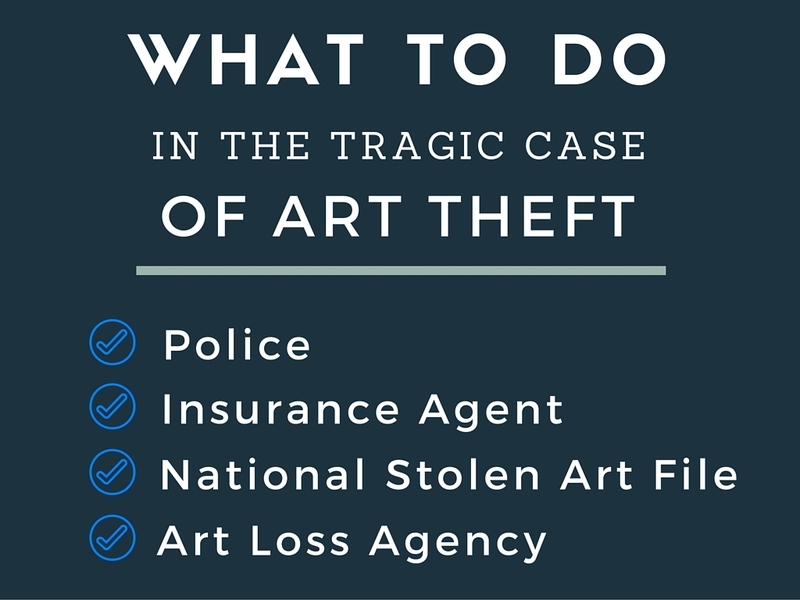 Trust in the experience of Toole Insurance, AXA Art America’s Corporation, the FBI Art Theft program, and art appraiser Alan Fuesel to understand the importance of keeping an updated archive of your art collection’s contents and value. Find more guidance about insurance policies for fine art, methods to hang and conserve your art, and more, in our free e-book, Essential Guide to Collecting Art.